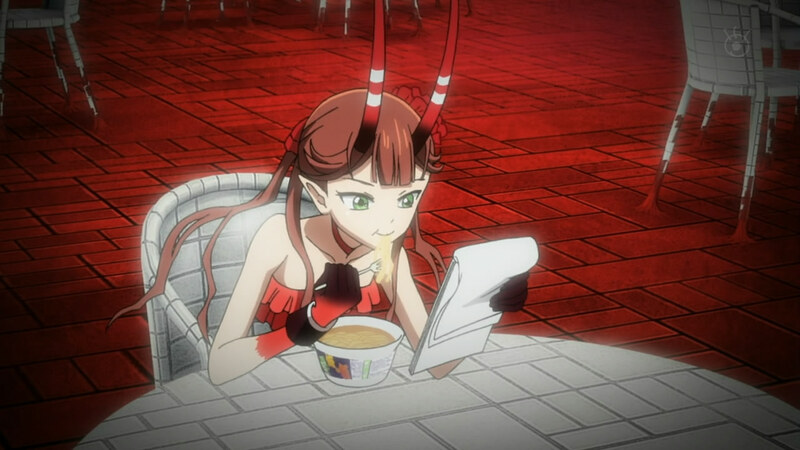 So, this episode was unique-ish in the sense that the rules of [C] don't seem to matter anymore. The fights kind of go however they want and the lengthy explanation of the rules (which they spent five episodes on) is wasted. I won't question their huge waste of time in a short 12-13 episode series; instead, I'll chalk it up to colourful filler. Throwing out the rules seems to be one of their better moves; maybe it will give them time to focus on the actual economics, for once. I would also like to point out: why do those people hate fighting guild members? It makes no sense. If I was part of the Financial District, it would be a godsend to fight them. You get a chance to steal large sums of money from someone without the risk of them trying to take your money. Worst case scenario, you lose a bit of money rather than a large sum to another Entre. This is probably a huge oversight on the writers' part, which I can't ignore; it makes me question how much thought is put into the script and if they actually know anything about economics. I think I browsed a few other blogs and this was extremely badly interpreted. They don't mean that Mikuni brought the country out of deficit; they are simply saying that he is keeping the country from falling further into it. Here's some slightly outdated info about the world's deficit, but at least it provides a nice visual. Every country is in deficit; to have zero deficit is actually considered "bad business", but that is an entirely different can of worms. 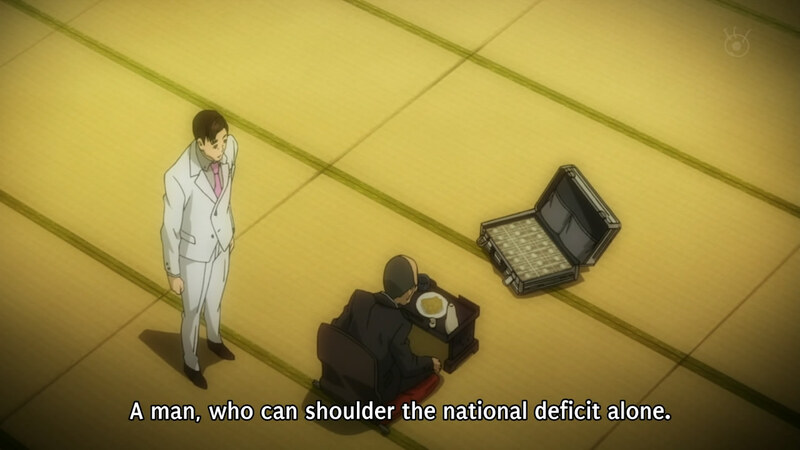 The point is that Mikuni is buying bonds, which the government issues out when they don't have any money. It is extremely bad when no one buys those bonds, since it shows that people don't trust the government to one day have the money to pay them back. Either way, Mikuni is just keeping the government from collapsing from deficit, not removing it all together. So, basically the Financial District has a huge negative impact. People disappear when they lose and the only gain is in the form of money for the winner. 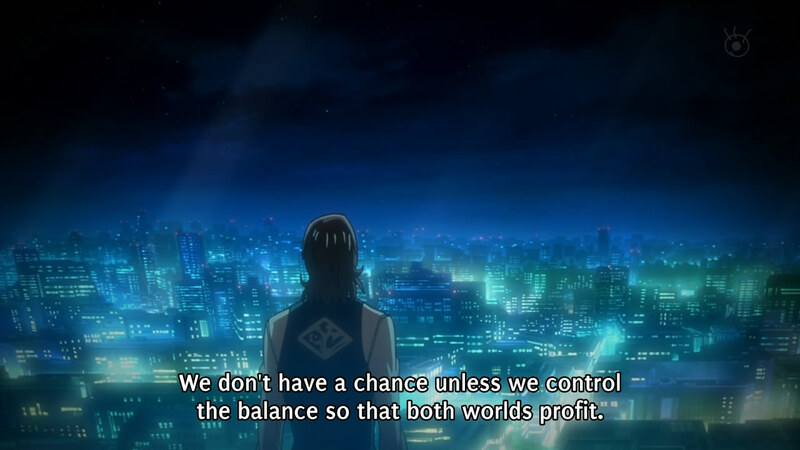 Considering the money gained is the same as the money lost of the loser, losing your "future" on top of that... Where is the extra gain somewhere else to balance things? Maybe it is to reverse the entropy effect!!!!! Inb4: Masakaki is saving the world from heat death. 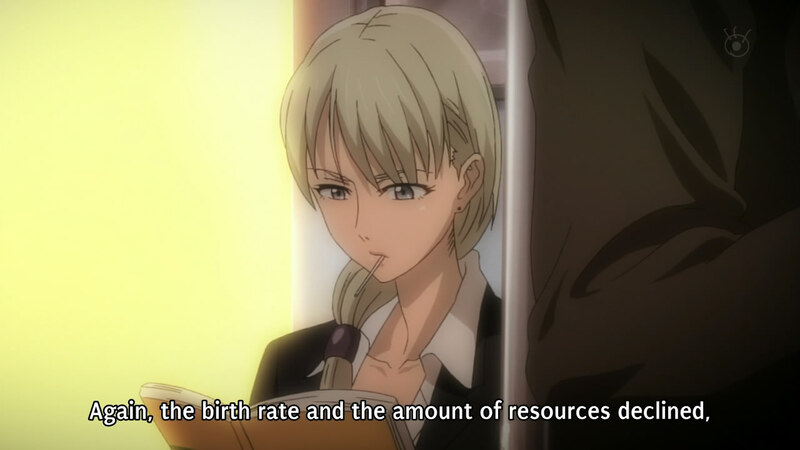 The blonde girl proposes cutting off the Midas money, which is nicely explained by Mikuni as to why it wouldn't work. Let me go more in-depth, since I'm sure many people don't understand what the problem is. The best real world example would be credit cards. We all use it, and pretty much anyone over a certain age has either used one or knows of many people that have it. This is similar to Midas money; it is extra money people are using that shouldn't exist. Now, what would happen if you removed Midas money is extremely similar to what would happen if credit cards all ended and everyone would be forced to pay off their loans... They wouldn't be able to. The net worth of most people in money doesn't exist. Removing credit cards would quite literally crash our entire world's economy at this point, because of how much it has grown. I think delving into this topic, though, is a bit too much of a tangent and if you want to learn more, just go Google or ask me. The point is that by leaving Midas money as it is and controlling the flow instead, you can have both of the worlds profit. 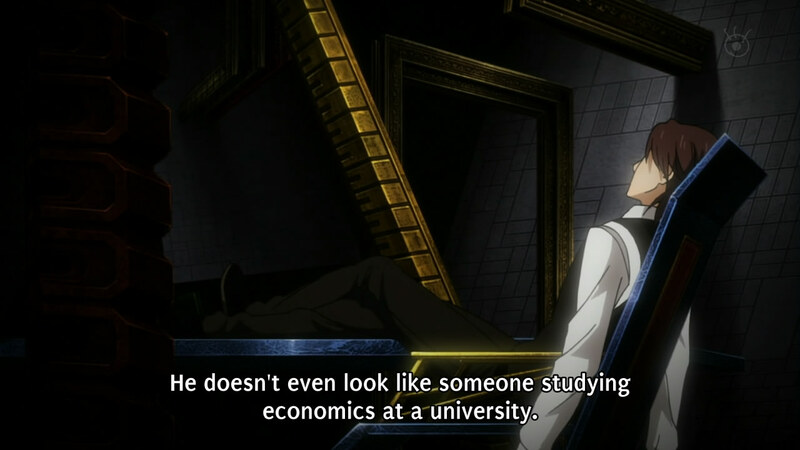 By the way, having Mikuni have to explain this to Kimimaro shows that he DESERVED to fail that economics class. 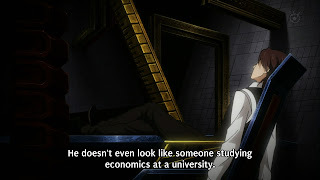 This is the first major dabble with real economics within this show. Just like my example with the credit cards, Midas money is clearly shown to be integral in the economy at this point. It is an allusion to the most current financial crisis that still affecting us today (US sub-prime mortgage crisis). In a nutshell, it was about lending money that doesn't exist and couldn't be paid back, which eventually collapsed in on itself. In this case, the Midas money exists and wouldn't collapse in the same way, but it would still have another effect. The Financial District is taking "futures", which is destroying the world slowly in a different way. 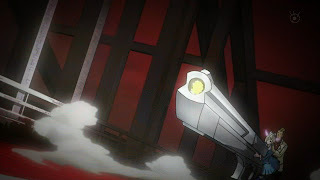 The huge problem faced in the anime can be related to [C], since it involves removing a large sum of money in the system without causing a huge recession. By the way, the problems brought to light by the latest recession were never solved, just quick-fixed, which will cause a greater recession somewhere down the road, which will have an even greater effect on the world. Either way, I've strayed greatly about the actual episode. I think this last dabble in real economics will be all they will ever really talk about. 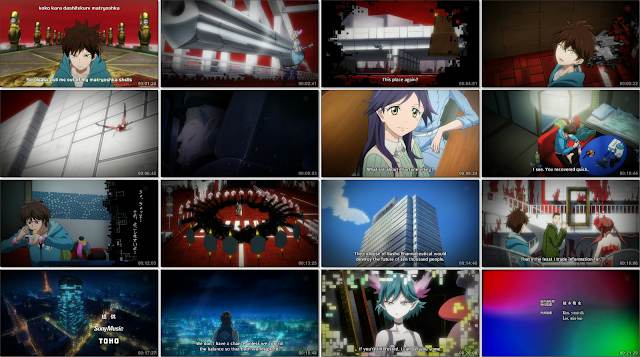 I'm pretty convinced that things will turn more shounen and the battles will solve all problems. I have two theories of how things will turn out. The first one is that Mikuni will finally gain control of the Financial District, but then will turn out to be evil and Kimimaro will have to beat him to save the day. The second theory is that Mikuni will lose, causing some huge backlash in the real world, leaving Kimimaro to take over to try to save the world. Things are looking a bit better with a real dabble with economics, but the problem is that it still has some very large strides to go to be considered decent with its derpy animation and horrid battle imbalances.